Aleš Hemský (Czech pronunciation: [ˈalɛʃ ˈɦɛmskiː], born 13 August 1983) is a Czech professional ice hockey player who is currently an unrestricted free agent. He most recently played for the Montreal Canadiens in the National Hockey League (NHL). He was originally a member of the Edmonton Oilers, who selected him in the first round, 13th overall, of the 2001 NHL Entry Draft. He played over ten seasons with Edmonton before being traded to the Senators in 2014. He has represented the Czech Republic at two Winter Olympics. Aleš Hemský is married to Julie Hemský, and they have one son together. On 13 December 2017, Hemský, along with teammates Jordie Benn, Andrew Shaw, Karl Alzner, Jeff Petry, Charles Hudon, and Artturi Lehkonen, all went bald as part of the Leucan Shaved Head Challenge, as well as raised $33,000 for children battling cancer. Hemský entered pro hockey as a 16-year-old, playing for HC Moeller Pardubice of the Czech Extraliga, in his hometown of Pardubice. He split the 1999–2000 season between Moeller and their junior club, HC Moeller Pardubice Jr. Hemský decided he had a better chance to be scouted if he played Canadian Junior hockey than if he tried to make the jump to the Czech Extraleague, and he subsequently became the first selection of the Hull Olympiques in the 2000 CHL Import Draft. In 2000, Hemský moved to North America to play for the Hull Olympiques of the Quebec Major Junior Hockey League (QMJHL). The following season, 2000–01, Hemský led all rookies in scoring with 36 goals and 100 points. He was named to the All-Rookie team, was selected to play in the 2001 CHL Top Prospects Game, and was awarded the Mike Bossy Trophy as the QMJHL's top pro prospect. Hemský continued his success in Hull during the 2001–02 season, with 27 goals and 97 points in 53 games, and finished 19th in the QMJHL scoring race. Hemský on the stage at the 2001 NHL Entry Draft, after the Oilers selected him thirteenth overall. On 12 October 2002, Hemský recorded his first career assist against the Nashville Predators. On 4 January 2003, Hemský scored his first career goal against the Montreal Canadiens, in his 26th game of his rookie season. During his rookie NHL season, he scored six goals and 30 points in 59 games, and was a healthy scratch for 23. He also went pointless in all six of Edmonton's playoff games. Hemský returned to the Czech Republic to play 47 games for HC Moeller Pardubice during the 2004–05 NHL Lockout. During that time, he scored 13 goals and 31 points, fifth on the club. Pardubice won the Extraleague championship for the first time in 16 years, and Hemský was named playoff MVP for his efforts. During the 2005–06 season, Hemský had a career year, setting personal bests in every major statistical category. He scored 19 goals, 58 assists and 77 points, while playing in all but one game for the Oilers during the regular season. The Oilers captured the eighth and final playoff seed in the Western Conference. In the playoffs, the Oilers went on to eliminate the Detroit Red Wings in six games in round one, then beat the San Jose Sharks in games as well in round two. In the Conference finals, the Oilers knocked off the Anaheim Ducks in five games. The Oilers, however, lost the Stanley Cup Finals in seven games to the Carolina Hurricanes. Hemský was an important part to the Oilers run to the Finals. Among his opportune goals were two he scored in the third period of game six against the Detroit Red Wings, including the series-winner. Hemský underwent a biopsy on an inflamed lymph node on the right side of his neck during the playoffs. Results have not been made public. Also that season, Hemský was selected to represent the Czech Republic in the 2006 Winter Olympics. Czech hockey icon Jaromír Jágr had a large influence on Hemský's selection, to the point where he insisted that Hemský skate on his line. The two had previously played together on the Czech team that won the 2005 IIHF World Ice Hockey Championships during the NHL's 2004–05 lockout season. Hemský scored twice in the Olympic tournament, and the Czech Republic defeated Russia in the bronze-medal game. Edmonton re-signed Hemský in the summer of 2006 to a six-year contract worth US$24.60 million. The 2006–07 campaign saw Hemský notch 53 points in 64 games, missing 18 games due to shoulder injuries. The 2007–08 season was a short one, as the Oilers were eliminated from playoff contention. Hemský finished first on the team overall in points scoring with 71, and was first in assists with 51. He sat in third place for goals with 20, a career high. The 2008–09 campaign was another that saw injuries for Hemský, who played 72 out of the 82 regular season games and finished first on the team with 23 goals and 43 assists for 66 points. 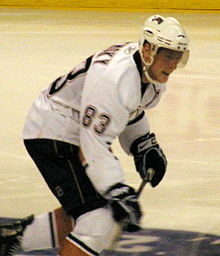 Hemský recorded seven goals and 15 assists during the first 22 games of the 2009–10 season before suffering a left shoulder injury following a check from behind by Los Angeles Kings forward Michal Handzuš. The injury required surgery and Hemský missed the remainder of the regular season. In the 2010–11 season, Hemský was named to the 2011 NHL All-Star Game, but did not participate due to a concussion. Hemský missed the remainder of the season due to a shoulder injury. Hemský, Taylor Hall, and Sam Gagner, led the Oilers with 42 points for the majority of the season, until the trio of injured players were surpassed by Jordan Eberle. Hemský recorded his 400th career point scoring a goal, in a 9–2 victory over the Chicago Blackhawks. After missing the first part of the 2011–12 season due to injury, Hemský struggled, posting just 11 points in his first 25 games, including a nine-game pointless streak. He picked up the pace thereafter, scoring 15 points in his next 22 games, leading the Oilers to sign him to a two-year, $10 million deal on 24 February 2012. On 21 March 2012, Hemský recorded his first career NHL hat trick, finishing with four points in a 6–3 victory over the Nashville Predators. After coming back from two shoulder surgeries, Hemský had a disappointing start to the season, and finished the year with 36 points in 69 games. In the final year of his contract and with the Oilers again out of playoff contention, on 5 March 2014, Hemský was traded to the Ottawa Senators for a fifth round pick in the 2014 NHL Entry Draft and a third round pick in the 2015 NHL Entry Draft. He quickly found success on Ottawa's top line alongside center Jason Spezza, recording six points in his first three games. He finished the season with 17 points in 20 games as the Senators fell short of the playoffs. Unable to agree to a new contract with the Senators, Hemský signed as a free agent on a three-year, $12 million contract with the Dallas Stars on 1 July 2014. In signing with the Stars, he was joined by Senators linemate Jason Spezza, who was coincidently traded to the Stars earlier in the day. Going to free agency, Hemsky signed a one-year, $1 million contract with the Montreal Canadiens on 3 July 2017. A severe concussion suffered during a game against the Anaheim Ducks on 20 October ended his season after only 7 games. By September of 2018, the Canadiens had not renewed his contract and no other team had yet shown interest, although symptoms from the concussion were gone. Hemský was a member of the bronze medal-winning Czech team at the 2006 Winter Olympics. He missed the 2010 Winter Olympics, but was selected for 2014 Olympic ice hockey tournament at Sochi in 2014 and became the highest scorer for the Czech team during the 2014 games, with three goals and four points. Hemský has also represented his country in three International Ice Hockey Federation (IIHF) world ice hockey tournaments, winning a gold medal with the team in 2005 and bronze in 2012. He made his first appearance in a Czech uniform for the 2002 World Junior Ice Hockey Championships. In addition to representing Czech Republic in ice hockey, Hemský represented his country in the IIHF inline hockey World Championship tournaments in 2008 and 2012. In the 2008 tournament, Hemský tied for fourth place in scoring with six goals and five assists while leading the Czech Republic to a fifth-place finish. but an injury forced him to withdraw. ^ Evans, Hilary; Gjerde, Arild; Heijmans, Jeroen; Mallon, Bill. "Aleš Hemský". Olympics at Sports-Reference.com. Sports Reference LLC. Retrieved 9 November 2011. ^ "Habs continue tradition of buying gifts for underprivileged children". CBC.ca. CBC News. 14 December 2017. Retrieved 16 December 2017. ^ Galarneau, Par Mathieu (24 April 2018). "Ales Hemsky est papa". quebec.huffingtonpost.ca (in French). Retrieved 6 June 2018. ^ Cowan, Stu (13 December 2017). "Stu Cowan: Canadiens make bald beautiful for a very good cause". Montreal Gazette. Retrieved 16 December 2017. ^ Robert Neuhauser (2001). "Ales Hemsky – a story of a scorer". Hockey's Future. Archived from the original on 30 October 2004. Retrieved 25 September 2006. ^ "Hemsky's profile at the Edmonton Oilers' website". Edmonton Oilers. Archived from the original on 3 September 2006. Retrieved 2006-09-25. ^ "NHL Game Summary – Detroit at Edmonton". 2006. Archived from the original on 22 June 2011. Retrieved 2006-09-25. ^ "Rejuvenated Hemsky sheds burden". The Edmonton Journal. Canada.com. 5 June 2006. Archived from the original on 4 March 2016. Retrieved 17 October 2014. ^ Terry Jones (2006). "Czech this out!". Retrieved 2006-09-24. ^ "Oilers' Hemský to have shoulder surgery; done for the season". www.tsn.ca. Archived from the original on 1 December 2009. Retrieved 2009-11-28. ^ Ian Mendes (2013). "MENDES: TRADING FOR HEMSKY EARLIER WOULDN'T MAKE DIFFERENCE". Retrieved 2014-03-11. ^ Sean Farrell (2013). "Predators beat Senators on Jones' OT goal". Retrieved 2014-03-11. ^ "Ales Hemsky lands in potentially great Dallas Stars situation". Edmonton Journal. 2014-07-01. Archived from the original on 20 October 2014. Retrieved 2014-07-01. ^ "Canadiens, Hemsky agree on one-year deal". The Sports Network. 2017-07-03. Retrieved 2017-07-03. ^ Labbé, Richard (17 September 2018). "Ales Hemsky sur le chemin d'une vie normale". La Presse (in French). Montreal. Retrieved 1 October 2018. ^ Labbé, Richard (30 March 2017). "La retraite pour Hemsky ?". La Presse+ (in French). Montreal. Sports, screen 4. Retrieved 1 October 2018. ^ Edmonton Journal. Trade-bait winger Ales Hemsky returns to Edmonton after successful Olympics run Archived 19 April 2014 at the Wayback Machine 25 February 2014 "The 30-year-old winger certainly helped the cause with three goals and one assist in the five games he played in Sochi with the Czech Republic. " ^ "Injuries mean changes at Top Prospects Game". 2001-02-05. Archived from the original on 2007-08-04. This page was last edited on 26 January 2019, at 23:32 (UTC).